At times, the image/video you come across might not be the real complete story, rather it might be just the opposite. With elections around the corner, everyone is trying their best to twist, change the meaning of the real complete video by trimming, clipping, showing you just a part of the entire story. 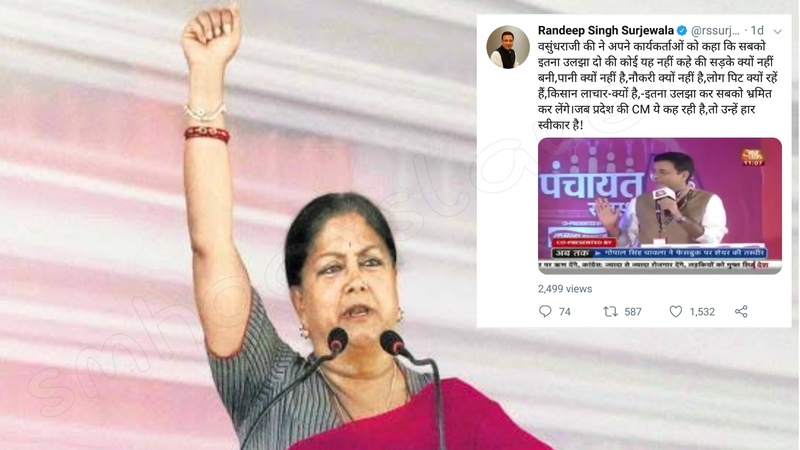 A small video is viral in which Rajasthan CM Vasundhra Raje is heard saying that confuse people so much so they don’t get time to ask you the real questions, i.e about employment, farmers, infrastructure etc. वसुंधराजी की ने अपने कार्यकर्ताओं को कहा कि सबको इतना उलझा दो की कोई यह नहीं कहे की सड़के क्यों नहीं बनी,पानी क्यों नहीं है,नौकरी क्यों नहीं है,लोग पिट क्यों रहें हैं,किसान लाचार-क्यों है,-इतना उलझा कर सबको भ्रमित कर लेंगे।जब प्रदेश की CM ये कह रही है,तो उन्हें हार स्वीकार है! Translated “Vasundhara ji asked her volunteers to confuse the public so they won’t ask why roads have not been built, why there is no water, why there are no jobs, why people are being lynched, why farmers are feeling helpless. “Thus people will be left utterly confused. If the state chief minister is saying this, then she has accepted defeat,” read the tweet that was retweeted by 535 users. Watch this complete video. Especially from 12:15 where she is saying that Congress said this, someone trimmed this ‘Congress’ part which made it sounds like she is saying it on her own. There had been many such instances of disinformation before. The truth of the machine you’ve been waiting for – Alu to Sona ! ← A robber holding a hostage, later shot dead in Venezuela is viral as ISIS. This celebration is in Pakistan, not Mira Road, Mumbai.